Oil Pan Gasket is sandwiched between the Oil Pan and the bottom of the Engine. When the Oil Pan Gasket leaks, it allows oil to escape down the side of the Oil Pan. This is usually a sign that it is time to replace the Oil Pan Gasket. Oil leaking down the outside of the Oil Pan will show up as a glossy dark trail. 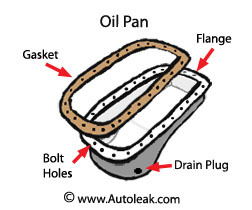 Due to the design of some cars and trucks, changing the oil pan gasket can sometimes be hard. Some vehicles even require the removal of the engine because vehicle parts get in the way preventing the oil pan from being removed. Please check for this before proceeding. Socket and ratchet for removing the Oil Pan bolts. 1 - On Level Ground - Raise part of car with engine (front or back) securely on ramps or jack stands. Block/chock wheels that are not raised so that they will not move. Make sure emergency brake is on, car is in gear and engine off. Make sure car will NOT roll on top of you while underneath it. 4 - As you get to the last few bolts in the Oil Pan Flange you will need to support the Oil Pan so that it does not put to much weight on the last bolts. If you do not do this, you may damage the bolts. 6 - For some cars, the Oil Pan will easily be removed completely from the car. In others cars part of the frame of the car will get in the way and it will not be possible to remove the Oil Pan all the way from the car. In either case the old Oil Pan Gasket will need to be cleaned/scraped off of the Oil Pan and the Engine. It is just harder to clean when the Oil Pan cannot be completely removed. 7- Make sure when cleaning off the old Oil Pan Gasket to remove any bits that get into the Oil Pan or inside the engine as you clean. 8 - Clean the inside of the Oil Pan with a clean rag. You may also see the Oil Pan magnet and this should be cleaned as well. All rags should be disposed of as per the regulations for where you live. It should be noted that Oily Rags can catch fire and should be stored in a flameproof container with a lid until disposal. 4 - After bolts are lightly tightened then do the final part evenly a little bit at a time rather than one bolt fully to avoid warping the Oil Pan. 6 - Refill the engine with the correct amount of oil before starting. Make sure to have put the Drain Plug back in the oil pan before adding the oil.